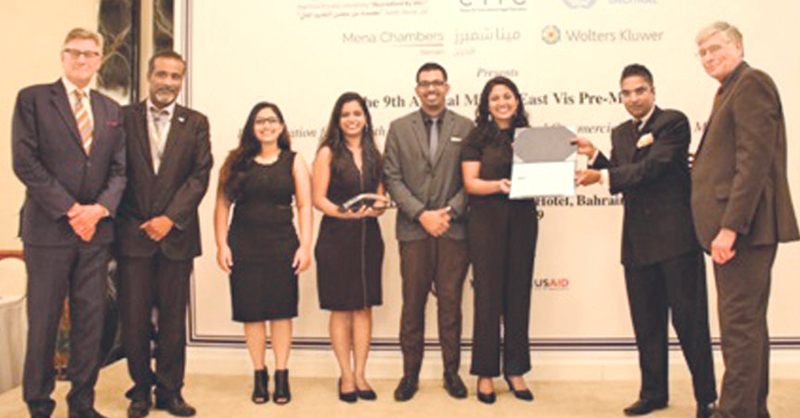 The 9th Willem C. Vis International Commercial Arbitration Moot, which is a legal competition for law students worldwide on the sphere of International Commercial Law and Arbitration, was held in the Kingdom of Bahrain, last week and teams from the Law College of University of Colombo emerged as the Champion while Royal Institute of Colombo was the Runners up. This was a unique feat since both the overall championship and the runners up were won by the two teams from Law Schools from Sri Lanka competing against a large number of Law Colleges and Universities in the entire region of Asia and MENA. The Sri Lankan teams were mentored by Harprabdeep Singh, a senior barrister practicing in Hong Kong and coached by three alumni of the Vis Moot from Sri Lanka Law College. The first Moot competition was held in 1994 with only eleven law schools from nine countries and, this year it has expanded to over 300 teams from nearly 70 countries. The Willem C. Vis International Commercial Arbitration Moot competition is fully funded by the Commercial Law Development Program (CLDP) of the US Department of Commerce and USAID. US Ambassador Siberell, in his address as the Chief Guest, underscored the importance and vitality of this competition during the last 25 years and the manner in which the competition had forged, shaped and molded noted legal luminaries, international arbitrators and judges, among others, in many parts of the world, during the past. He also accentuated the seminal and critical role played by commercial arbitration in the context of economic and commercial advancement and progress of corporates, nations and regional groupings. Ambassador of Sri Lanka, Dr. Mendis, in his keynote address, commended both the Sri Lankan teams from University of Colombo and Royal Institute of Colombo and stated that the winning of this championship was a reflection of the caliber, stature, tenacity and perspicacity of not only the respective law students who vied and contended but also of the faculty members and mentors/coaches in Sri Lanka as well as the standing of the two Law Colleges.